First of all, apologies for the delay on posts, been quite busy with work lately. Went down to the Hacking for a fish with dad. As the weather has been slowly warming up, plenty of baitfish about in the Hacking. In particular, some good sized slimy mackerel to about 25cm. Be sure to use a flexible rod and a light (or no) sinker and use a small hook with a bit of pilchard. They can easily be sight fished as they are only a metre or so down. I am not sure if they are good to eat, but they make good bait as the meat is oily. Not so good as live bait as they are not as hardy as the yellowtail. After catching enough for bait, we cubed some fresh ones out. 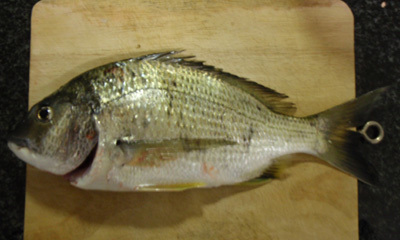 Main catches were undersized snapper with the exception of this bumper bream which measured about 35cm.